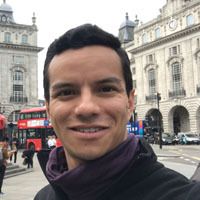 The University of Warwick is pleased to welcome over 150 students from Latin America each year, studying from foundation programme to our research degrees. We currently have 29 students from Colombia studying on our campus. All the information you need on making your application to Warwick can be found below. If you have any questions, please don't hesitate to get in touch with us. Summary guidance for nationals of Colombia is provided here. Please see the Immigration section for further advice. The University of Warwick typically visits Colombia every year. Future visits will be advertised here when available. If you're unable to meet us in country, you can join us online at our weekly live chat. Information on scholarships available to nationals of Colombia for full-time study at the University of Warwick can be found here. If you want to read more about Warwick, the application process and student life, direct from our students, please visit the links below. The University of Warwick does not currently have representation in Colombia, but please feel free to contact either Inova Education or LoveUK, our agents based in Mexico, who will be happy to advise you via Skype or email. Tom Parker and Hannah Jones are your dedicated contacts for Colombia. They are happy to answer any queries or questions you may have.